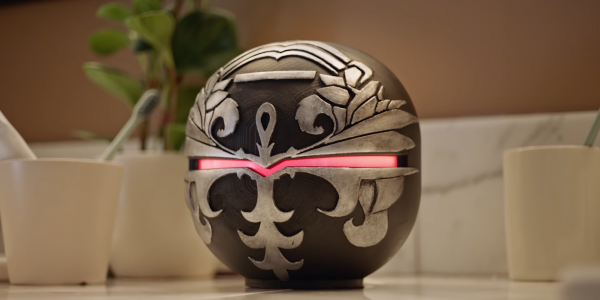 Square Enix revealed this morning the new Final Fantasy XIV Omega smart home assistant for players to purchase. This real-world item is similar to the ever-popular Alexa but featuring a nice circular version of the world-ending raid boss. You can use it similar to Alexa in that you can give it commands and it will follow through with it. Square Enix showed off the Final Fantasy XIV Omega home assistant in a trailer dropped today. If you couldn’t tell already, this is Square Enix’s April Fool’s Joke for this year. There certainly won’t be an Omega for sale as a smart home device anytime soon. Even though it totally looks rad in the trailer. You can watch the trailer for yourself below. Basically, the trailer shows the family using the Final Fantasy XIV Omega smart home device in various ways. It will not only give you the stats from last night’s basketball game but also make you question everything you know. In fact, it’ll even delete your hard work if it thinks that you have no chance of succeeding anyway. And when you’re in the mood for some romance, it will gladly play some Final Fantasy XIV tunes to set the mood. This is far from the first Final Fantasy XIV April Fool’s Joke. Last year was by far our favorite, mainly because we wish it was true. It was for a smartphone game similar to Pokemon Go that lets you farm for in-game materials on the go. That’s something we desperately need, by the way. And the year before that, that year’s April Fool’s Joke was a mashup of Tactics Ogre and the Alexander raid fights. Finally, the very first FFXIV April Fool’s Joke was ChocoGo, an app that is basically Uber but with Chocobos instead of cars. Sorry to everyone who really wanted to purchase the Final Fantasy XIV Omega smart home assistant for reals.